After a year of having a bike I still haven't improved that much on my cycling skills but I am glad to say that after only five months since I first started jogging I think my progress in running was satisfactory. A month after jogging 2 to 3 times a week I ran 10K in 60 minutes. Last week, 1 covered 12K in the same amount of time. 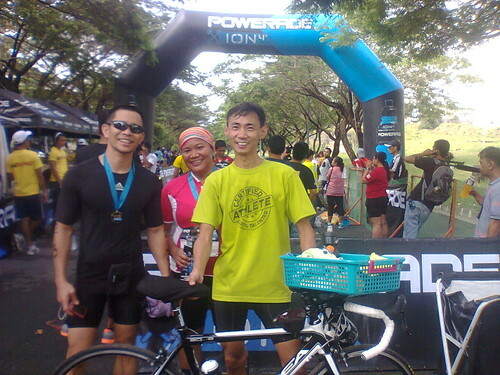 The first leg of the Powerade Duathlon was my second attempt at the sport. 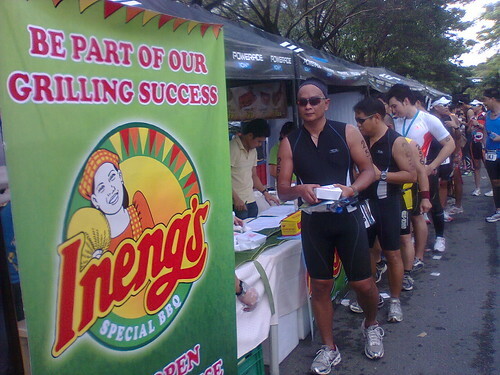 Also in Filinvest, Muntinlupa City last January, 2012 my first duathlon was a mix bag, a good first run, a slow ride, and a run-walk-limp finish. 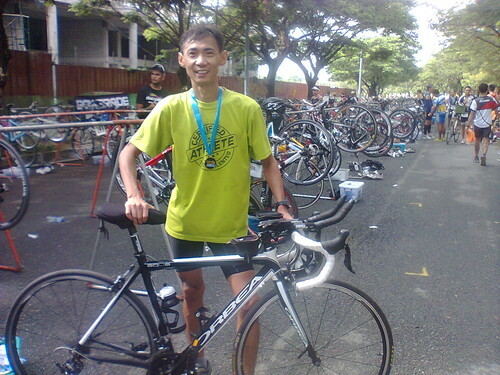 For the Powerade Duathlon, my objective was still the same, to finish the race without getting hurt. With almost 500 participants in such a race course I didn't think setting a PR was on most racer's mind. I started from the back so passing more than a hundred runners was my priority until my bladder called for a halt. The run was relatively uneventful compared to the 30k bike leg where some guys in front of me were shouting at each other due to aggressive overtaking. I almost bumped into a guy as he was overtaking me on a sharp curve, and there was this biker in blue who slid down on the asphalt just as I was looking on my back. And the mamaws who kept on overtaking us slow bikers that took some momentum from guys like me who were left to use the more crowded outer lane. The second run started fine, by half distance there was the expected cramps so I started to walk and when I continued to run it hit me again. When it subsided I ran slowly but got to finish line without limping, a better finish for my legs than the last duathlon. Right after crossing the line someone gave me my finisher's medal and another one got the timing chip from my ankle. Then I chatted with some participants. 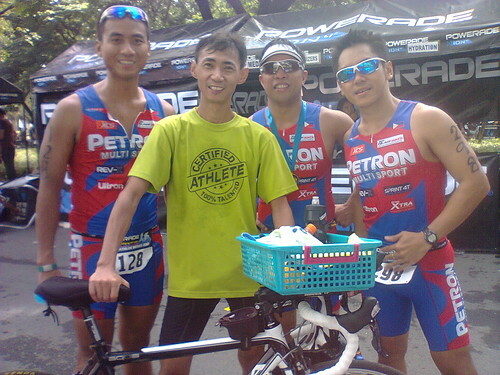 I ran in with the Petron guys who were of course faster than me. 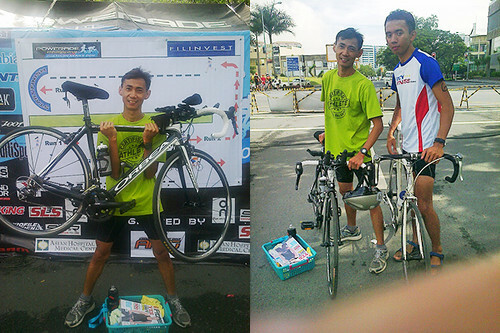 I knew them from my first triathlon at Ayala Alabang Village. I also saw the very fast and young Omar from my first duathlon which happened to be the classmate of my former badminton friend. He told me he's going to ride in Lucena this coming April with his classmate and when I knew that it was with our common friend I replied that we'll definitely ride together. 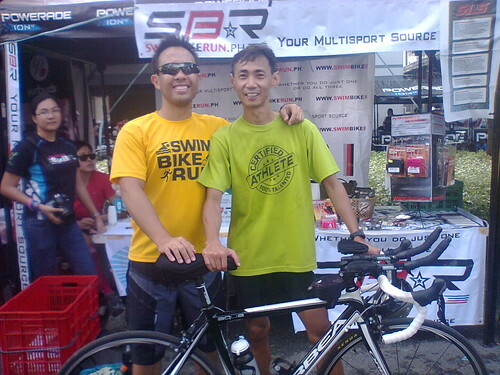 And the highlight of my picture taking was with Mr. SwimBikeRun.ph himself right at his booth. I didn't get to eat the free meal which looked pretty delicious because I was tending to my photographer/daughter eagerly wanting to go to ATC. And lastly before the start of the race there was this girl who was always being hounded by video cameramen wherever she went and documented whatever she did. She must be a celebrity, and yes she was Ms. Jennylyn Mercado of Team Tri Mac.